Even with the drought that Yukon, Oklahoma has experienced in the last several years, it is still necessary to have proper yard drainage systems installed for the times when we do receive a downpour of rain. The proper use of French drains can solve a lot of problems that can occur when heavy rainfall occurs in Yukon, Oklahoma. 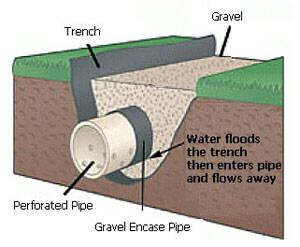 A French drain is an underground water drainage system that is designed to drain unwanted water from houses, yards and other landscapes to the proper place. It is also known as a weeping tile or French ditch. 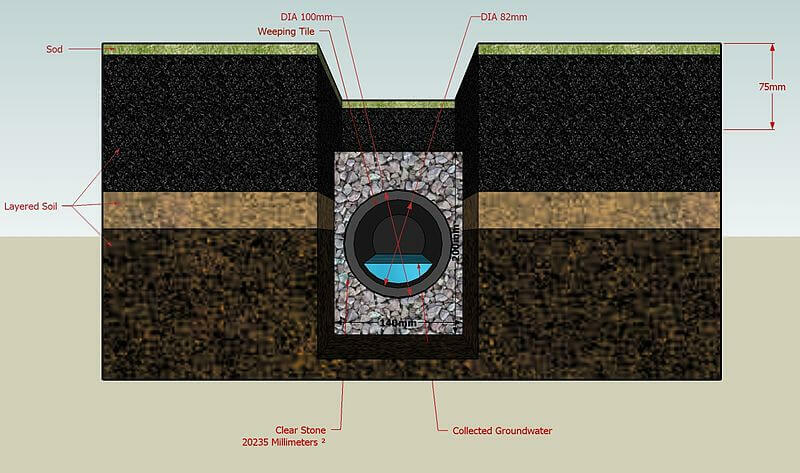 The design of a French drain includes a perforated pipe covered with gravel on all the sides which is used to draw water away from any area of concern. Lately, a properly engineered French drain is more popular because of the use of light weight gravel covered with filter fabric instead of rock and gravel for better performance of such drains. A French drain in Yukon can help save large buildings and houses from foundation failures and water logging problems. With the proper design and installation from a contractor like Bill’s Custom Concrete, a French drain can solve many water problems at your property. With all these features and benefits a French drain in Yukon, Oklahoma, it is many times the best way to drain underground water effectively. The drain can be widened according to the requirement of the drainage system which makes them more efficient to drain maximum amount of water. To know if a French drain, or some other type of yard drainage system is right for you, it is best to have a professional come to your home or business to give you a complete evaluation. Bill’s Custom Concrete and Yard Drainage has been serving Yukon, Oklahoma since 1976 with yard drainage solutions that work. Call us today at (405)755-3975 for your free evaluation to see if a French drain is the right solution for your Yukon property. You can also contact us through our contact form here.